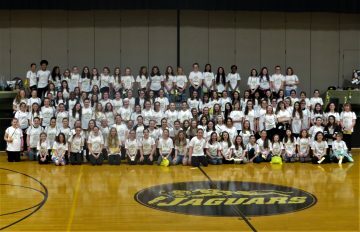 Building upon the success of last year’s inaugural event, Girls Only Leadership Development (GOLD) Night returned to Pleasant Hills Middle School on Friday, April 5, 2019, with 140 middle-school girls participating in a variety of fun and educational sessions designed to foster positive relationships, build confidence and boost self-esteem. Led by Dr. Melissa McCauley and an all-female team of volunteers and instructors, this year’s event included sessions on navigating careers in male-dominated fields, team building, fashion tips for teens, mindfulness, art, self-defense and healthy lifestyles. Each girl received a drawstring bag upon entering filled with water, snacks, gum, candy, earbuds, key chain flashlight and t-shirt with the event’s tagline of “We Shine like Gold.” The evening kicked off with an energizing song and dance choreographed by the eighth-grade girls to Mackenzie Ziegler’s “Teamwork” to get everyone pumped up before heading to their break-out sessions. The girls enjoyed pizza and cookies at the end of the night and had the opportunity to win special prizes and gift cards. • Alicia Candela, Owner and Founder of No Limits ATA Martial Arts and a contestant on American Ninja Warrior this season! It was truly an inspiring evening of friendship, fun and unity with many shining moments. Special thanks to Dr. McCauley and the GOLD Night Committee, the amazing female presenters, and the many businesses and community members who graciously donated their time, money and supplies to help make this event possible.